Today it is easier than ever to learn how to program a computer. Everyone has one (and probably has several) and there are tons of resources available. You can even program entirely in your web browser and avoid having to install programming languages and other arcane software. But it wasn’t always like this. In the sixties and seventies, you usually learned to program on computers that didn’t exist. I was recently musing about those computers that were never real and wondering if we are better off now with a computer at every neophyte’s fingertips or if somehow these fictional computing devices were useful in the education process. Back in the day, almost no one had a computer. Even if you were in the computer business, the chances that you had a computer that was all yours was almost unheard of. In the old days, computers cost money — a lot of money. They required special power and cooling. They needed a platoon of people to operate them. They took up a lot of space. The idea of letting students just run programs to learn was ludicrous. 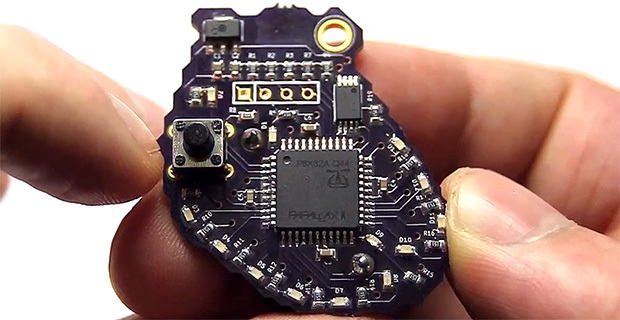 A few years ago, [Addie] over at Tymkrs put together a spooky little Halloween project: a small Propeller board that emulates the electrical signals in a heart. As a cardiac nurse, she thought her project could use a little improvement, and after two years she’s finally done. It’s a heart-shaped board that simulates electrical signals moving through the heart. There are several key areas that conduct electrical signals through the heart – the sinoatrial node, atrioventricular node, and bundle branches all work like players in an orchestra to keep a heart beating like it should. If something goes wrong with one of these, the heart goes into tachycardia or fibrillation – not good, by any measure. [Addie]’s board simulates all the different ways a heart can go wrong with LEDs standing in for the electrical signals in a real heart. The name of the game here is to look at the LEDs and tell what state the heart is in. The PCB heart is just one part of [Addie]’s heart simulator. The simulated heart can also plug into a neat little heart-shaped project box wired up with a solenoid, LCD display, headphone jack, and other electronics to turn this electronic heart into a complete study tool for heart rhythms. The nurses in [Addie]’s unit love the thing, and it looks like [Addie] might have a real cardiac training tool on here hands here.